Past purchases ? unlike intentions expressed through surveys or correlated with other segmentation data ? 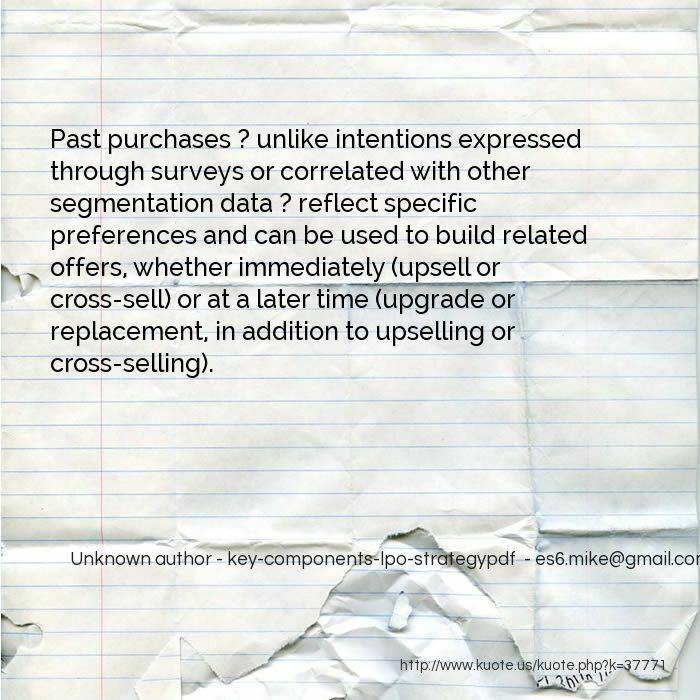 reflect specific preferences and can be used to build related offers, whether immediately (upsell or cross-sell) or at a later time (upgrade or replacement, in addition to upselling or cross-selling). 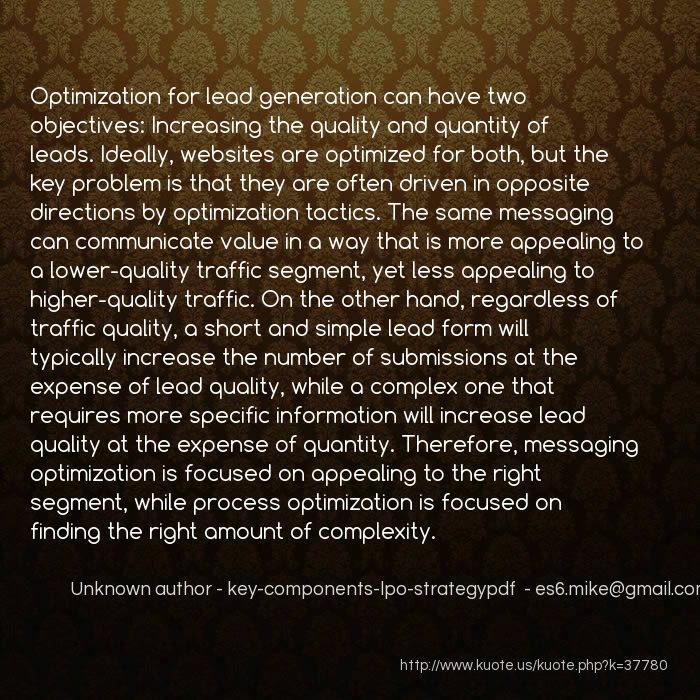 Optimization for lead generation can have two objectives: Increasing the quality and quantity of leads. Ideally, websites are optimized for both, but the key problem is that they are often driven in opposite directions by optimization tactics. The same messaging can communicate value in a way that is more appealing to a lower-quality traffic segment, yet less appealing to higher-quality traffic. 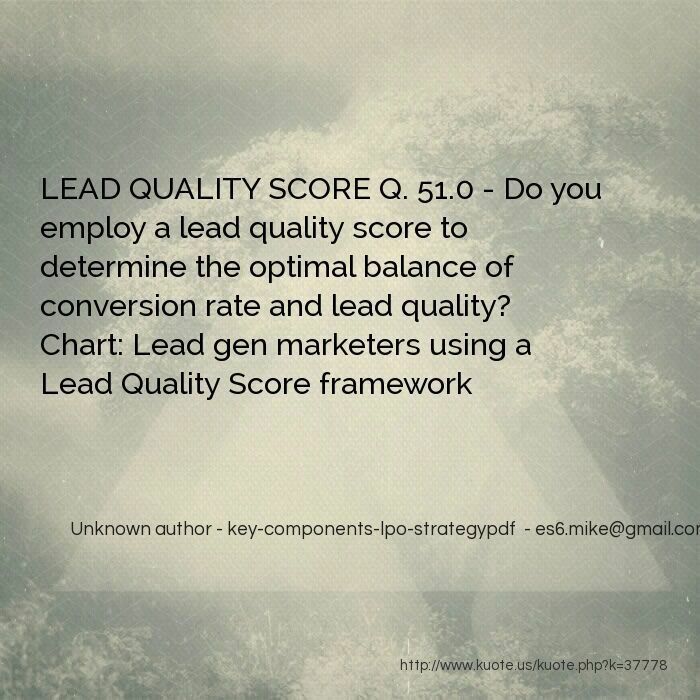 On the other hand, regardless of traffic quality, a short and simple lead form will typically increase the number of submissions at the expense of lead quality, while a complex one that requires more specific information will increase lead quality at the expense of quantity. Therefore, messaging optimization is focused on appealing to the right segment, while process optimization is focused on finding the right amount of complexity. 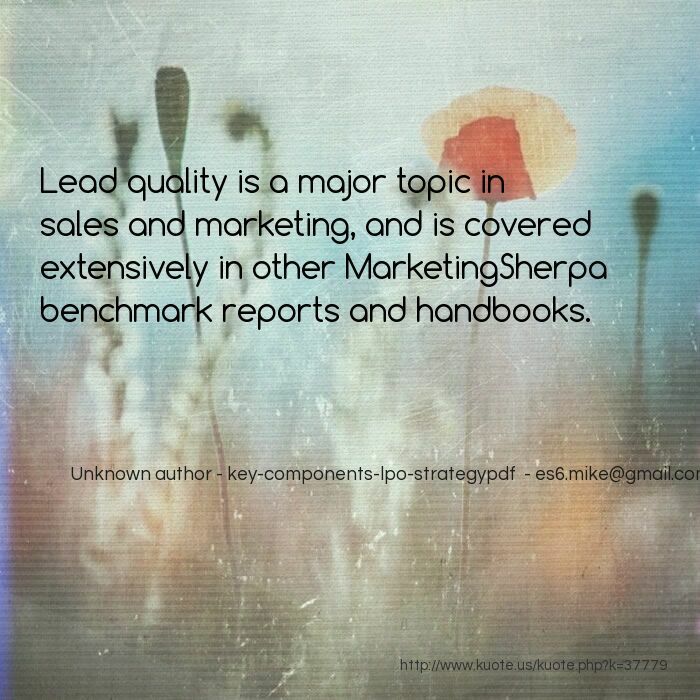 Lead quality is a major topic in sales and marketing, and is covered extensively in other MarketingSherpa benchmark reports and handbooks. 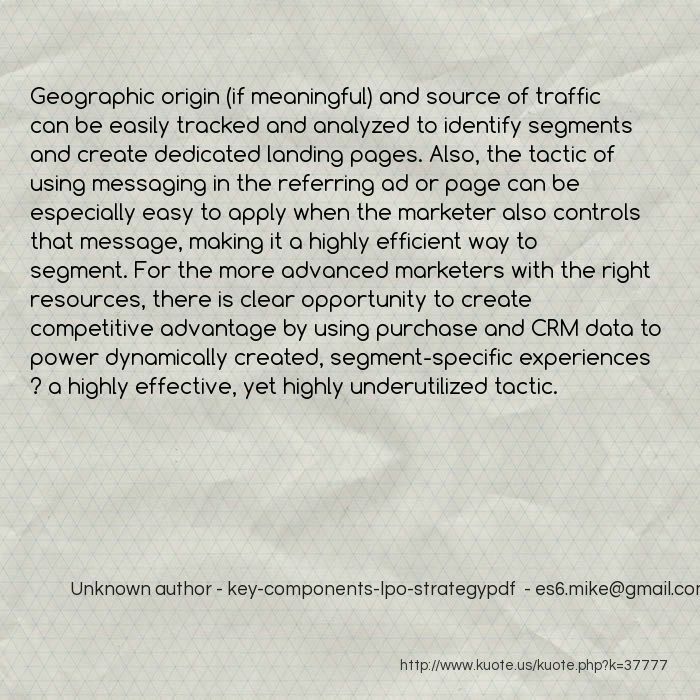 Geographic origin (if meaningful) and source of traffic can be easily tracked and analyzed to identify segments and create dedicated landing pages. Also, the tactic of using messaging in the referring ad or page can be especially easy to apply when the marketer also controls that message, making it a highly efficient way to segment. For the more advanced marketers with the right resources, there is clear opportunity to create competitive advantage by using purchase and CRM data to power dynamically created, segment-specific experiences ? a highly effective, yet highly underutilized tactic. 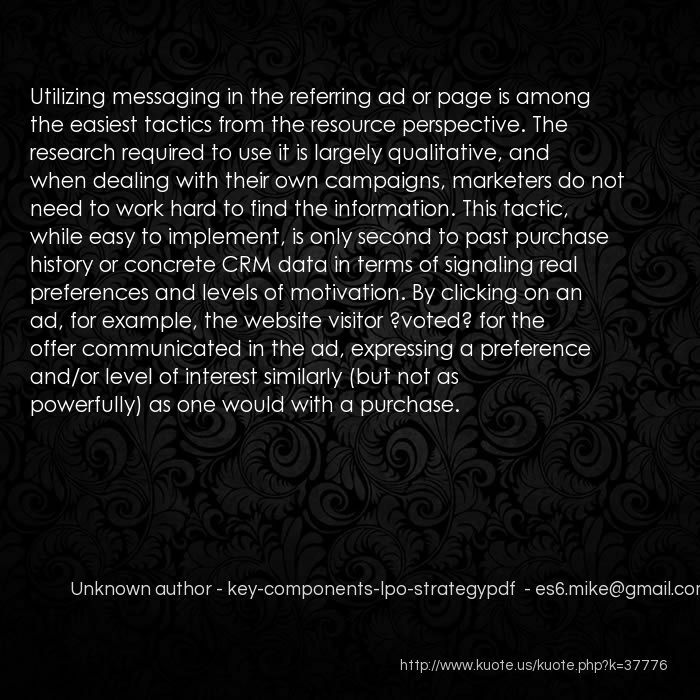 Utilizing messaging in the referring ad or page is among the easiest tactics from the resource perspective. The research required to use it is largely qualitative, and when dealing with their own campaigns, marketers do not need to work hard to find the information. This tactic, while easy to implement, is only second to past purchase history or concrete CRM data in terms of signaling real preferences and levels of motivation. By clicking on an ad, for example, the website visitor ?voted? for the offer communicated in the ad, expressing a preference and/or level of interest similarly (but not as powerfully) as one would with a purchase. B2B marketers are placing relatively higher value on seasonality data to segment their visitors. Seasonality can be defined with respect to any time variables, from calendar categories (seasons, days of week, time of day, etc.) to product- or industry-specific buying cycles. 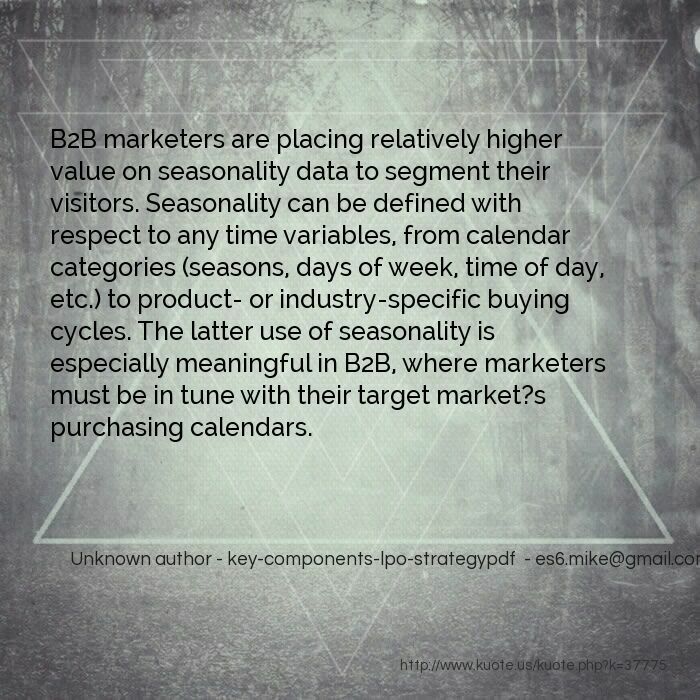 The latter use of seasonality is especially meaningful in B2B, where marketers must be in tune with their target market?s purchasing calendars. 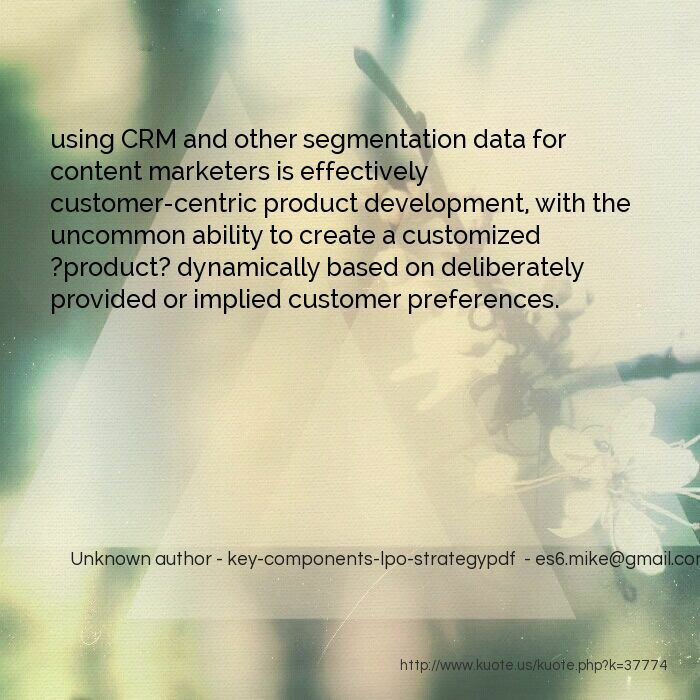 using CRM and other segmentation data for content marketers is effectively customer-centric product development, with the uncommon ability to create a customized ?product? dynamically based on deliberately provided or implied customer preferences. 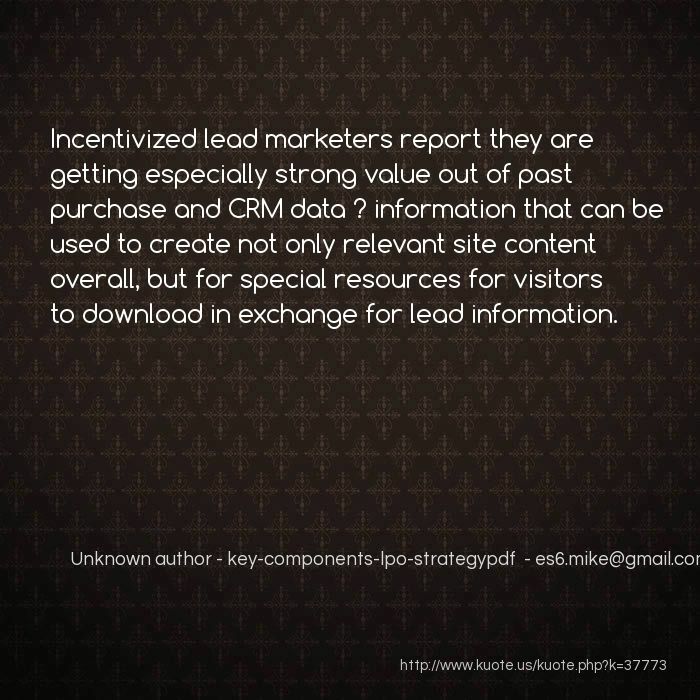 Incentivized lead marketers report they are getting especially strong value out of past purchase and CRM data ? 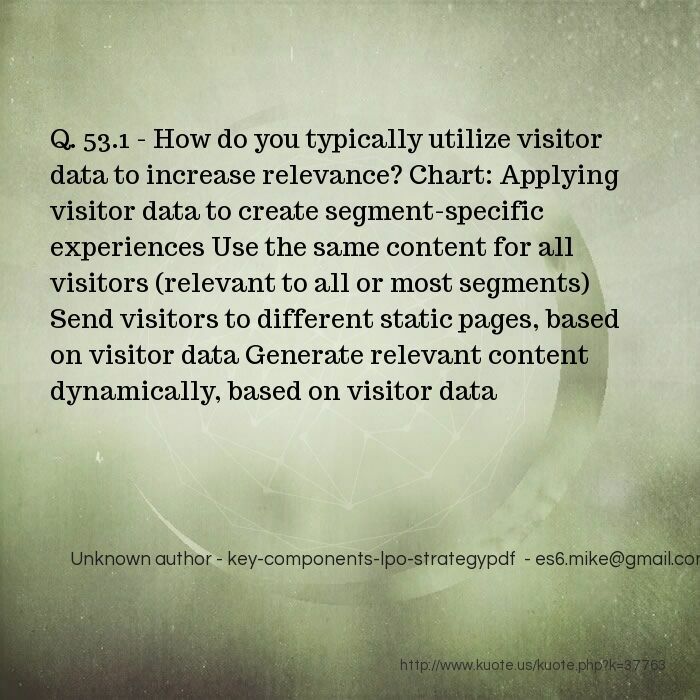 information that can be used to create not only relevant site content overall, but for special resources for visitors to download in exchange for lead information. 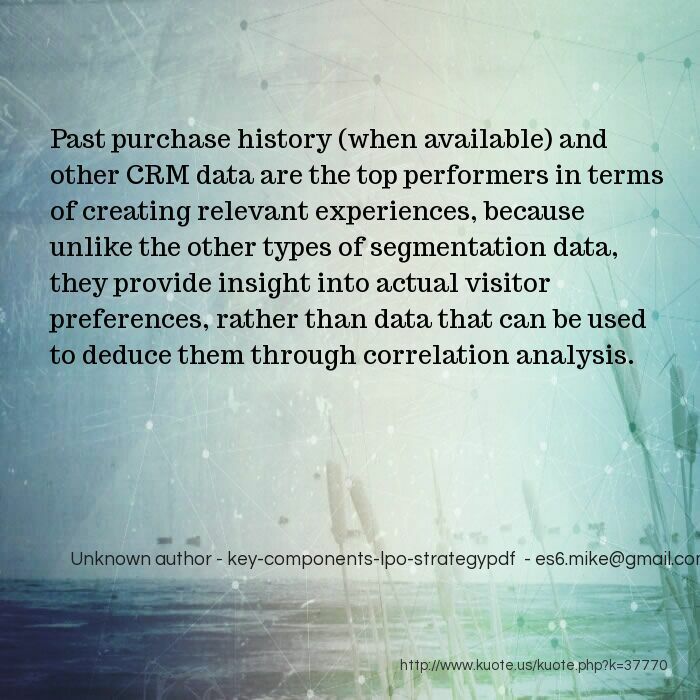 Past purchase history (when available) and other CRM data are the top performers in terms of creating relevant experiences, because unlike the other types of segmentation data, they provide insight into actual visitor preferences, rather than data that can be used to deduce them through correlation analysis. 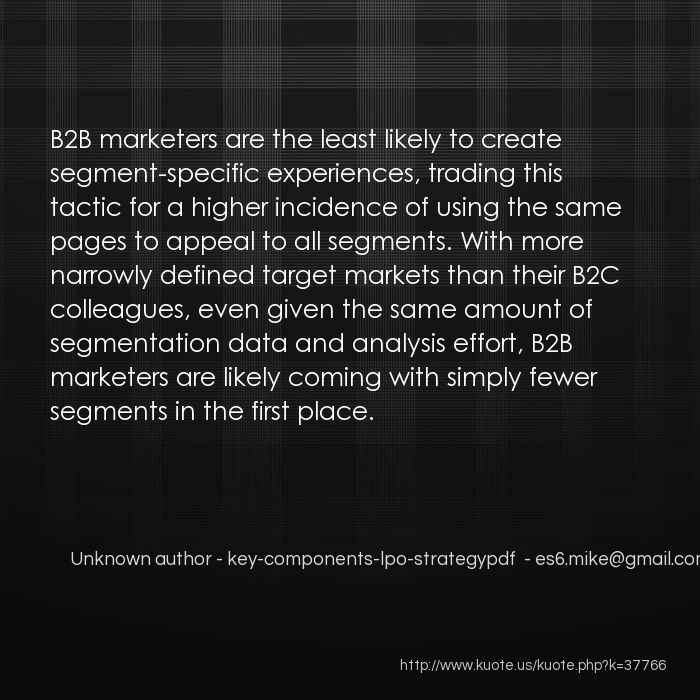 Also, some marketers may deliberately ignore or even discourage certain segments. In lead generation scenarios, poor lead quality can bog down the Sales department and reduce the ROI of the website traffic by increasing the cost side of the equation. In SEM, marketers used two key tactics to reduce low-quality traffic (and save the CPC spend): Use negative keywords to keep their ad from appearing in front of the wrong audience in the first place, and when the ad does show up, to signal certain aspects of the offer (e.g., premium price category) to lead the potential visitor to self-disqualify and click elsewhere. For low-quality traffic that does end up on the landing page, marketers can use similar tactics (discussed later in this chapter) to reduce the volume of low-quality leads. 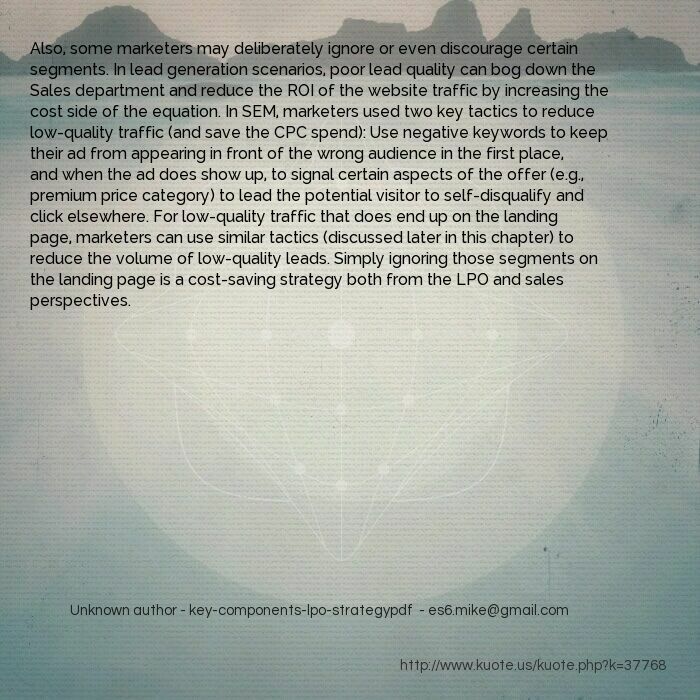 Simply ignoring those segments on the landing page is a cost-saving strategy both from the LPO and sales perspectives. When the number of ?useful? 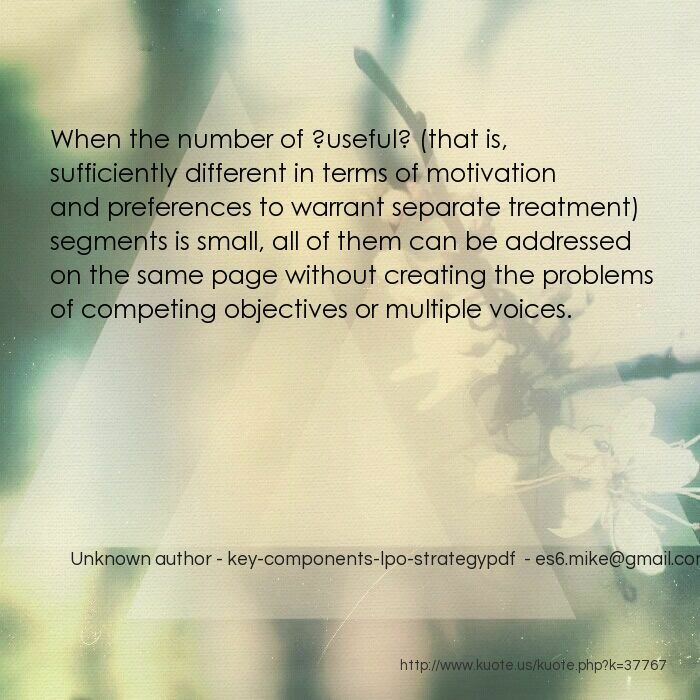 (that is, sufficiently different in terms of motivation and preferences to warrant separate treatment) segments is small, all of them can be addressed on the same page without creating the problems of competing objectives or multiple voices. B2B marketers are the least likely to create segment-specific experiences, trading this tactic for a higher incidence of using the same pages to appeal to all segments. With more narrowly defined target markets than their B2C colleagues, even given the same amount of segmentation data and analysis effort, B2B marketers are likely coming with simply fewer segments in the first place. 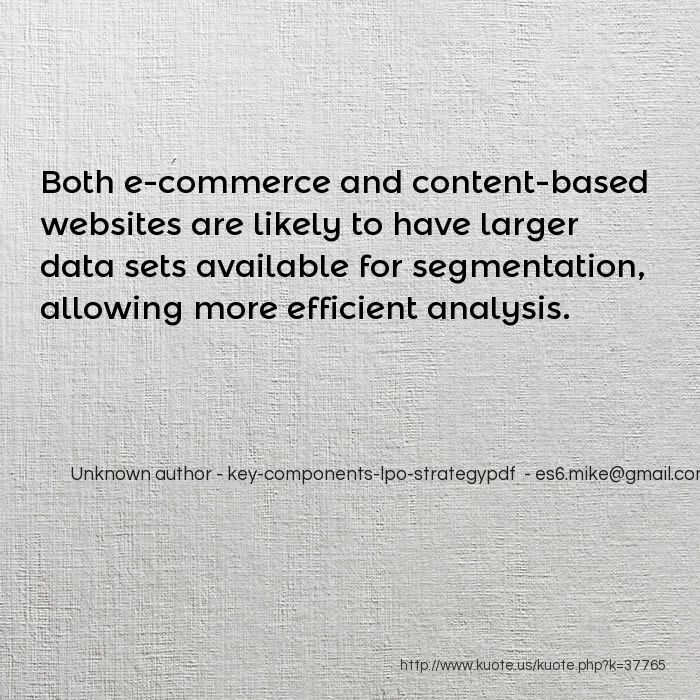 Both e-commerce and content-based websites are likely to have larger data sets available for segmentation, allowing more efficient analysis. Since the definition of ?dynamic? is broad, the latter group of marketers certainly includes those that perform minimal customization ? 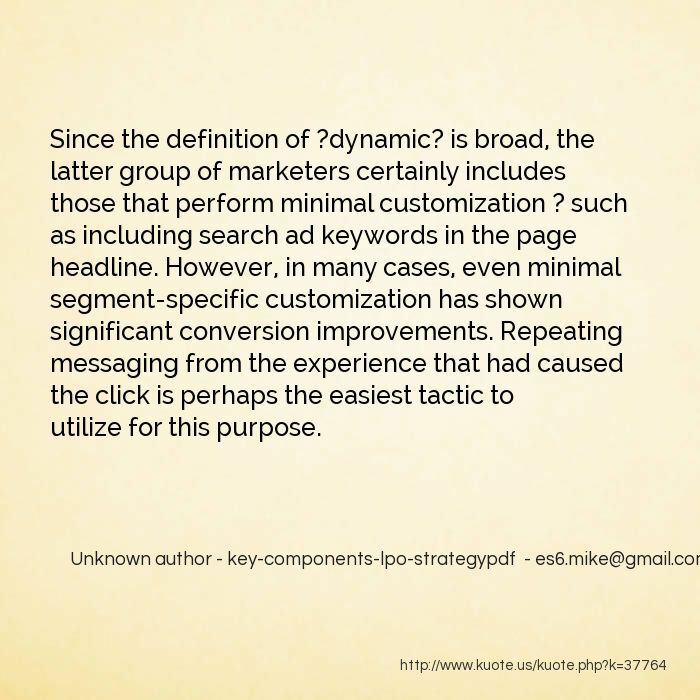 such as including search ad keywords in the page headline. However, in many cases, even minimal segment-specific customization has shown significant conversion improvements. Repeating messaging from the experience that had caused the click is perhaps the easiest tactic to utilize for this purpose. 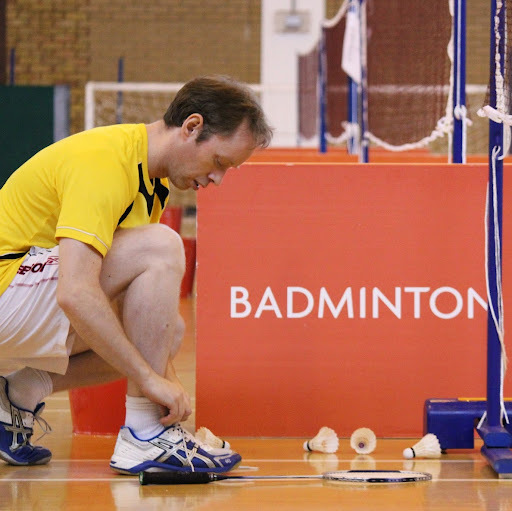 Smaller data sets are not only more manageable, but also more actionable. 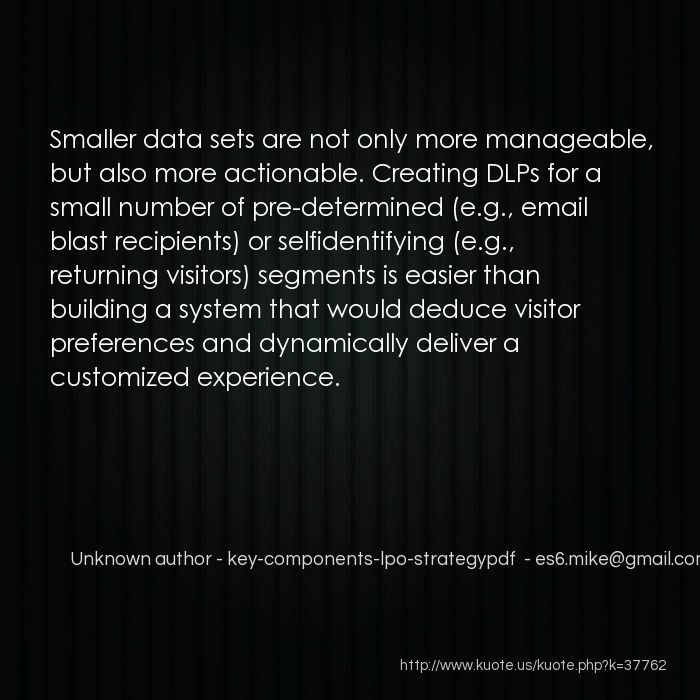 Creating DLPs for a small number of pre-determined (e.g., email blast recipients) or selfidentifying (e.g., returning visitors) segments is easier than building a system that would deduce visitor preferences and dynamically deliver a customized experience. 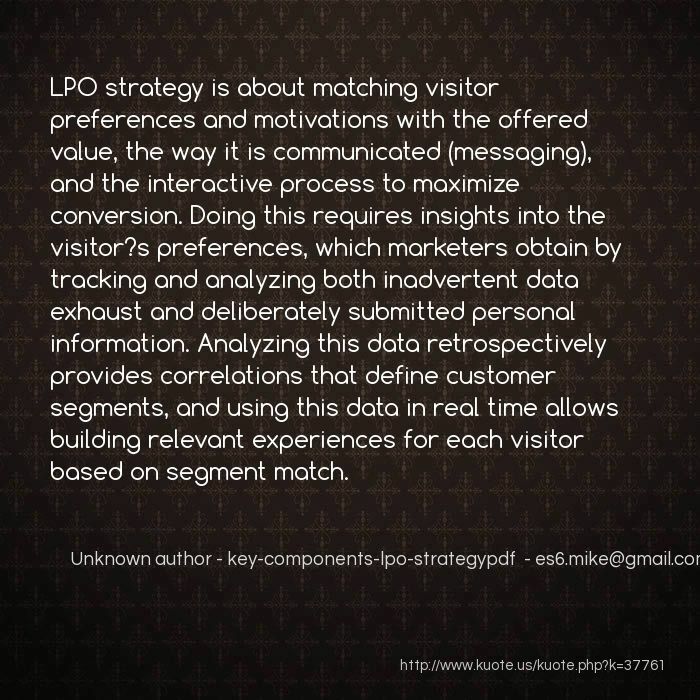 LPO strategy is about matching visitor preferences and motivations with the offered value, the way it is communicated (messaging), and the interactive process to maximize conversion. 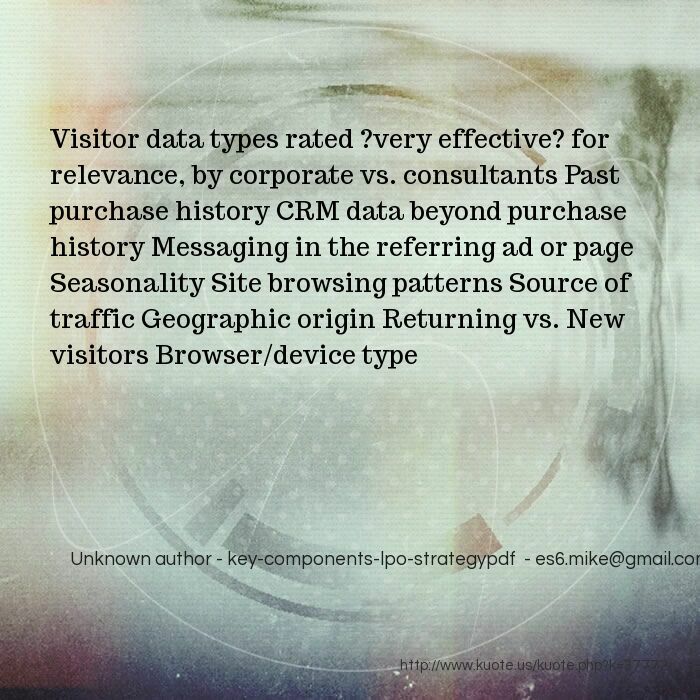 Doing this requires insights into the visitor?s preferences, which marketers obtain by tracking and analyzing both inadvertent data exhaust and deliberately submitted personal information. 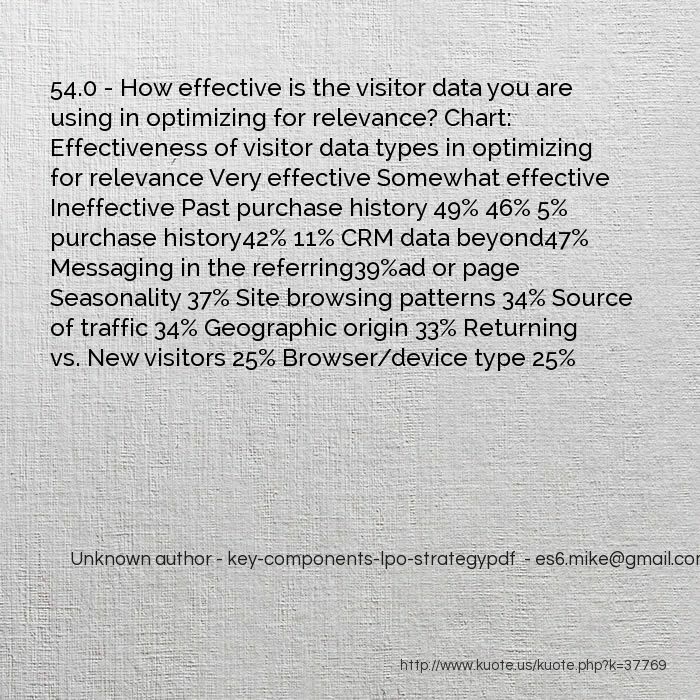 Analyzing this data retrospectively provides correlations that define customer segments, and using this data in real time allows building relevant experiences for each visitor based on segment match.